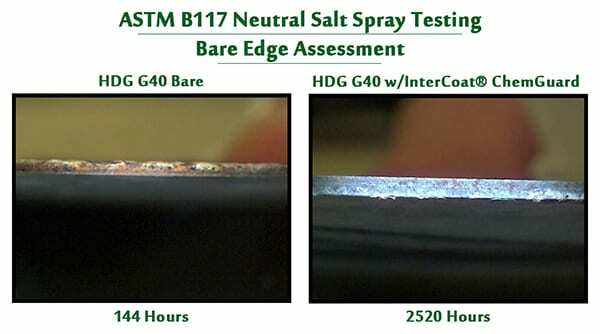 G235 treated with Hexavalent Chemtreat (top) vs. G40 treated with InterCoat® ChemGuard (bottom).Test: ASTM B117 salt spray test on hot dipped galvanized. A leading coil coater and manufacturer of proprietary coating chemistries has recently introduced InterCoat®ChemGuard, a new type of corrosion protection for galvanized steel. InterCoat®ChemGuard uses a new type of coating technology that utilizes covalent bonds and enhances the effectiveness of zinc and substantially improves corrosion protection on galvanized steel. Standard practice to protect metal from corrosion for approximately the last 70 years has been to coat it with zinc. Heavier zinc coatings have normally been applied to provide longer protection. This was the industry standard practice, until now. InterCoat®ChemGuard, instead, reacts with the zinc to form a permanent, covalent bond on the surface of the metal. The product is applied over a light layer of zinc, which reacts with the zinc to dramatically improve its corrosion protection properties. The bond which is formed at the molecular level cannot be washed or worn off. This is different and more effective than the typical barrier coating. This revolutionary process allows bending, stamping, post-painting and even shearing, while providing self-healing characteristics that help protect newly exposed zinc that naturally occurs during secondary processing. InterCoat®ChemGuard is a major development for any user looking to extend the corrosion resistance of galvanized steel. The product is RoHS compliant and continues to protect during stamping, roll forming, shearing and is weldable. With a low coefficient of friction, it actually enhances these processes. InterCoat®ChemGuard is designed to be applied on the galvanize line or, for custom formulas, by the original coil coater and developer of this unique compound. G40 bare (left) after 144 hours and G40 with InterCoat® ChemGuard (right) after 2520 hours. 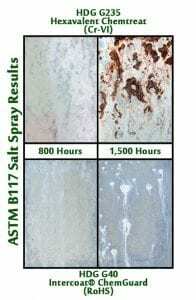 Test: ASTM B117 salt spray. InterCoat®ChemGuard offers significant cost savings because it allows for lighter zinc to form the bond. It is not necessary to apply heavy zinc; it reduces the need for zinc coatings heavier than G30, in many applications on the market today. 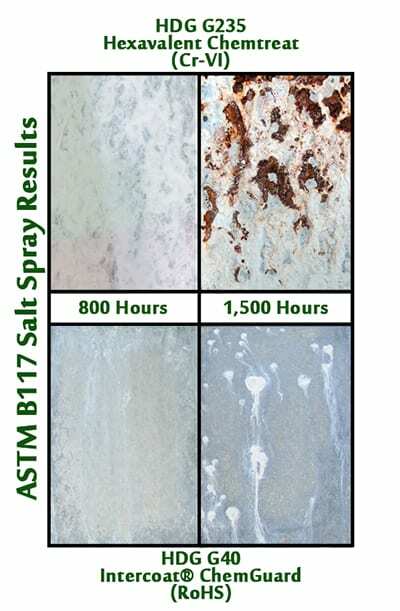 The product also eliminates the need for temporary corrosion protection coatings, often used in shipping and materials storage, including hexavalent chrome, a known carcinogen, making it more environmentally friendly for all building, architectural, transportation and consumer appliance applications. 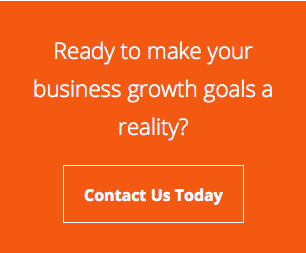 It is applicable to many industries, including automotive, aerospace, construction, electrical conduit, wall studs, furniture, fixtures, appliances, outdoor and highway railing, agricultural, lawn and garden and other products using galvanize.